As well as the face of the Duchess of Cambridge, the National Portrait Gallery has also recently acquired the spirit of Amy Winehouse. 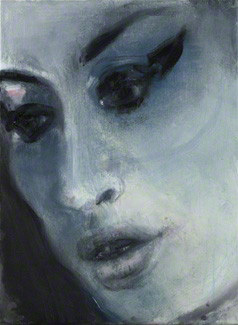 The ‘Amy – Blue’ portrait by Marlene Dumas, puts less emphasis on the photographic reality of the singer and more on the movement, the emotion, the crazy. It was one of the very few portraits which has managed to stop me in my tracks. It may be abstract, but it has successfully captured the person behind the face. I think this may be helped by the face of Amy herself. I imagine that it is much easier to pack a painting full of spirit when the real face is so dramatic (e.g. hard and angled). That way the artist is able to reduce the face down to its composite parts and have it still recognisable as a portrait. I would liken it to an abstract landscape – you can be a lot freer with your interpretation of an instantly recognisable skyline such as New York or London – because it serves as a baseline context for the viewer.